1.Londoners or anyone not in rural areas are being discriminated against as the government has made “special plans” for people in rural areas, whereas those in already built up areas, often with homes in extreme proximity to the line, are not entitled to equal compensation measures. We can only assume this 2 tier system is due to costs in densely populated areas and we believe it is wrong and unfair. 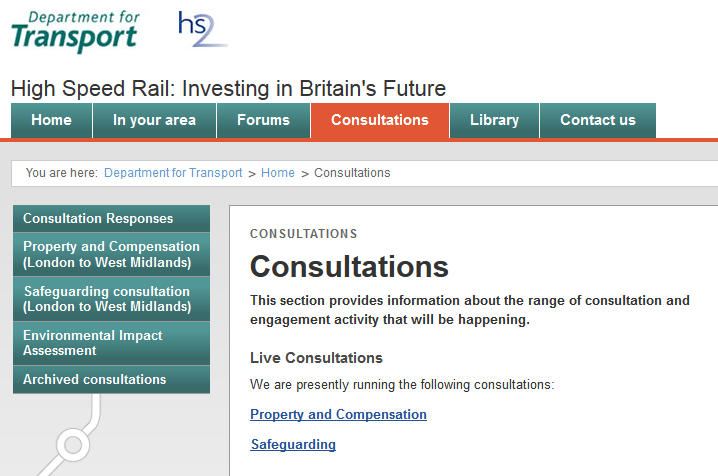 If the government believe HS2 is worth the money it is worth doing fairly. 2. HS2 Ltd staff this morning did not know the details of the consultation and maps despite being in the area today meeting residents – again this can only cause further confusion. 3. The massive safeguarding area in the Colne Valley, a vital green area for Londoners including SSSI, shows the massive impact the Heathrow Spur will have on this area – despite not yet being consulted on and being classed as phase 2, residents and businesses in this area are now restricted for decades whilst the plans are not in the public domain. 4. It is unclear for the 100s of families living close to or above the Ruislip tunnel whether they are entitled to anything other than a survey before and after the building of the tunnel, and subsoil rights. Where an area is blighted by HS2, tunnelled or not, people should be able to move and sell their house at full market value regardless of HS2. 5. We do not agree with a hardship scheme where people have to qualify on restrictive grounds– if because of government activity someone cannot sell their house then we believe the government is and should be accountable and we do not believe people should have to display a hardship to be able to move – it is a right of a homeowner to sell on the market and make life choices! 6. The government have increased the time someone has to try to sell their house from 3 months to 12 months before even being considered by the hardship scheme – if redundant or bereaved this is particularly disgraceful! To date few hardship applications have been successful. 7. We have no faith in this consultation process due to the loss of previous responses to the previous consultation and it is evident in the content that previous responses on compensation have not been taken into account. 8. The new maps prove the impact on the Hanger Line gyratory is potentially massive – with the construction of HS2, the Heathrow Spurs and impacts on arterial roads to this degree, accessing west London will be a nightmare for years and none of these impacts or costs are factored into the HS2 business or economic case. 9. There is no allowance for compensation or assistance during construction with some Hillingdon residents facing construction from 2017 to 2033 this is unacceptable. 10. They promise research on properties above tunnels from Crossrail and Hs1 -none of those trains go as fast as HS2 so the research will not allay worries or be comparable.